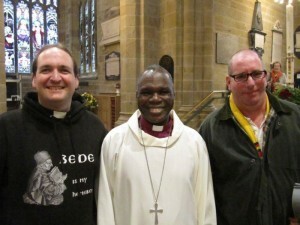 In April there was a big celebration at Wakefield cathedral in to celebrate 25 years of the diocesan link with Tanzania. The service was well attended and Bishop Hilkiah preached an inspiring sermon. He told the congregation how much the link meant to the people in Tanzania and how much progress is being made with the projects that we continue to support. The water for life project has done some excellent work ensuring clean water for lots of people. The Bunda bible college is continuing to grow and the school at Essenya continues to develop. The link is important to all of us here in both Wakefield and Tanzania. It is not only about providing financial aid but real partnership between places. We get so much back from our link parishes in prayer but also through learning how other people manage to prosper on very little. In news from our link parish of Guta, they have recently spent the money we sent out on finishing the vicarage. They have also built a small guest house next door to accommodate visitors.